Victoria Beckham is so stylish and the streets are going crazy over her tailored masculine jackets with a boxy silhouette and a slightly nipped waist that balances the proportions. 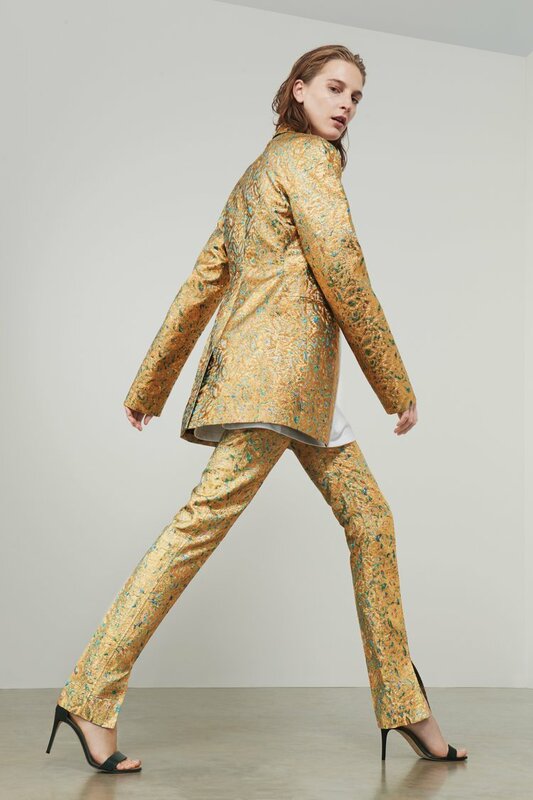 Cut from a dramatic shimmering gold floral lurex with an intricate floral pattern all over in multi colours, contrasting the minimal construction of the jacket which has a neat lapel, single back vent and inserted pockets taking inspiration from a men's jacket. These are my favorites from the new collection. I love her style too and she's one of my favorite Spice Girls. Yeah, she is so stylish. Love her style and the items you picked from her collection are so pretty! Thanks for stopping by Claire. beautiful collection for sure, love that gold suit. What a fabulous style, so edgy and classy. These are lovely. I especially like the colorful suit.